Georgia and I made the two and a half hour drive to Oshkosh on Sunday morning and went directly to Wittman Regional Airport, site of AirVenture 2008. Monday will be the official kickoff day but, getting there a day early gave us an opportunity to get oriented without fighting the huge crowd to come. After noting the locations of exhibits we didn’t want to miss and grabbing some lunch, we left the airport to check into our motel. The Oshkosh Super 8 Motel just might be one of the best kept secrets of AirVenture. Back in January, when I was looking for places to stay, I kept passing this motel up. Then, I heard it mentioned on the Uncontrolled Airspace podcast. The location sounded conveniently close to the field and, it had a view of runway 27. I went ahead and booked a room with the idea that I would keep looking for something better to open up. I never did find any other vacancies so, Super 8 it was. As we entered the parking lot, we could see that the popular Friar Tuck’s is right next door and, the motel property backs up to the airport fence. Right on the other side was the North 40 camping area. After unloading the car, I walked back by the fence where I discovered the secret no one had told me about. Not 50 feet from the back door of the motel was a gate in the fence and, the shuttle bus that drove around the North 40 stopped just inside that gate. 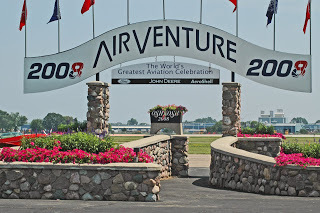 We could walk out of the motel, get on the bus and be dropped off at the AirVenture site. No need to fight the traffic or to pay for parking! Once settled in our room, we tried out the bus run. The yellow school bus dropped us off at the North 40 welcome center where we caught the tram to AreoShell Square. After looking around there for a while, we continued on the tram route out to the ultralight area. We had dinner in the vintage aircraft area while we watched the arrivals on runway 36. Then we traveled by tram and bus back to our motel room to prepare for opening day.